At College Mall Veterinary Hospital our team of veterinary professionals truly loves what they do. The success of our work depends on the contributions made by every employee of our hospital and we recognize that each and every team member is vital in delivering the highest standard of care our clients and the community has come to expect. All of our team members are not only highly skilled and dedicated to continual growth, but compassionate, professional, and strongly support the human-animal bond. Andrew is one of our RVTs! 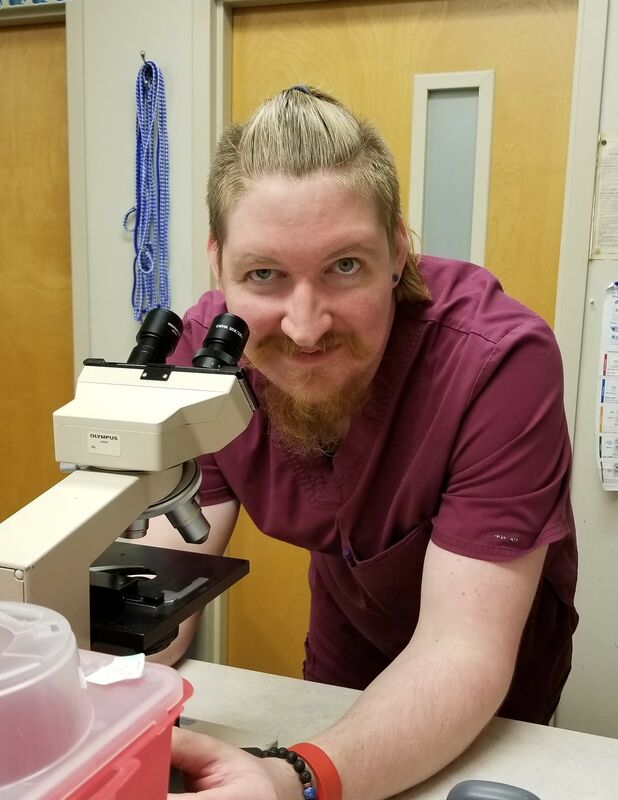 Andrew graduated from the (IBC) Vet Tech Institute Fort Wayne and is currently taking classes and pre-requisites at Indiana University in order to attend vet school. Andrew joined our team in 2017. 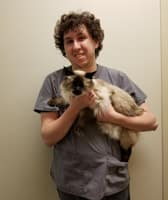 His favorite part of working in veterinary medicine is feline health and working with cats. Andrew has 2 cats and a mouse: Steve, an orange and white DSH; Lizzy, a black and white- large and in charge DSH, and Pepper Jack, a black mouse! When Andrew is not at the hospital or working on his studies he enjoys watching TV/ Anime and playing video games. 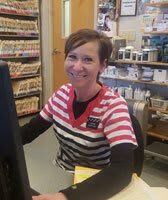 Mary is one of our RVTs and is the Lead Technician at our Hospital! Mary graduated from Indiana University in 2007 and worked in public health and clinical research. 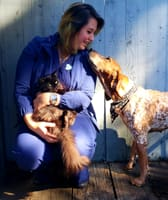 After working for several years in areas associated with ‘human health’ she decided to change gears and focus on ‘animal health’ and became a Registered Veterinary Technician. Mary graduated from (IBC) Vet Tech Institute Indianapolis, completed an internship with our hospital, and joined our team in 2013! 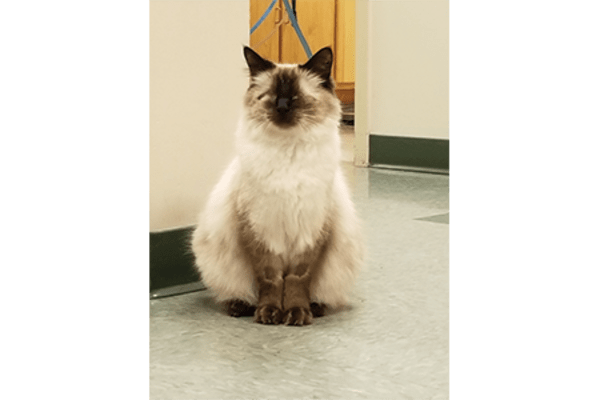 One of her favorite things about veterinary medicine is how it is constantly evolving and how the continuous advancements can be utilized to improve patient care. One of her favorite parts of working at the hospital is working with and helping to improve or maintain the health of patients that come from local shelters and rescues. She enjoys seeing them flourish in their new homes! Mary is also a member of the Monroe County Humane Association’s Board of Directors. She currently lives in Bloomington with her husband, Patrick, and their 3 cats and 2 dogs: Cyrus J. Rotten, a handsome, long-haired grump; Sedaris Vicious, named for David Sedaris, the matriarch of all the animals; Sayid, a beautiful Havana Brown Mix who enjoys hiding; Stanley, a black and white Pit Bull Mix, who is as stubborn as he is sweet and lastly Dolores, a beautiful blue and white Pit Bull Mix who loves to snuggle. When Mary is not at the hospital she enjoys cooking, trying new restaurants, running, reading, and antiquing. Emma is one of our Veterinary Assistants! Emma graduated from Indiana University Bloomington with a focus in animal behavior and biology. 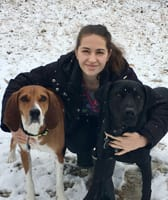 Since graduating Emma has worked for the Brown County Humane Society and the IU Biology Department as a Research Assistant. Emma is now pursuing a degree in Veterinary Technology from Purdue University in order to become an RVT. Her favorite part about working at our hospital and in veterinary medicine is being able to learn new things every day! Emma has 2 dogs- Fred, who looks like a black lab mix, but his DNA results classify him a “mega-mutt”- he is the most handsome guy and Rose, a Coonhound, a vocal little lady who loves to play… until she doesn’t! Emma also has a super suave Leopard Gecko, Gus, and a curly haired Tarantula, Phillip, who is reclusive. When Emma isn’t caring for patients at the hospital or working on her studies she enjoys doing animal behavior research at IU and hiking with her dogs. She also enjoys traveling and is hoping to make it to her last two states this year so she’ll have been to all 50 states! Gabriel is one of our Veterinary Assistants! Gabriel graduated from Indiana University Bloomington with a bachelor’s degree in biology and a minor in animal behavior. Gabriel joined our team in 2017! Gabriel’s favorite part of working at our hospital is getting to get to know and care for each and every one of our patients. He also enjoys ensuring Vivian, our office cat, is getting enough attention and nap time. Gabriel has three animals: Oliver, a yellow lab who is a very loving, large lap dog; Shadow, a grey and white DSH, who is lazy, demanding, and enjoys face pets; and Jay, a Blue Heeler/Cattle Dog with non-stop energy and in-your-face kisses! When Gabriel isn’t at the hospital he enjoys playing soccer, cards, video games, watching movies (especially The Dark Knight), and leisurely drives through the countryside. 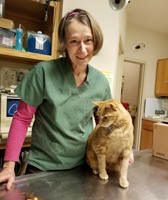 Nina is one of our Veterinary Assistants! 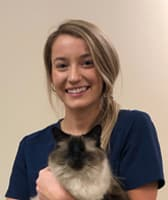 Nina graduated from (IBC) Vet Tech Institute Indianapolis and joined our team after completing her internship with our hospital in the summer of 2018! 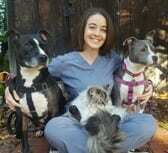 Nina enjoys helping educate clients on keeping their pets healthy! Nine loves caring for our patients and helping them get better. When Nina isn’t at the hospital she stays busy with her son who enjoys video games, reading, comic books, and playing with animals! In her free time she enjoys drawing, reading, listening to music, and spending time with family and friends! Nina has three animals: Fancy, a Red Ticked Coonhound, who is the sweetest little lady; Sabbath, a black domestic longhair, who is the queen of the house; and Aleister, a black and white kitty, who is a very lovable boy! Paula is one of our Veterinary Assistants and Receptionists! Paula holds a teaching certificate and graduated from Indiana University with a focus in English and political science. Paula and her husband, Dave, live just North of Spencer. They share their 40 acres of farmland, woods, and ravines with their many animals: Ripley, a Border Collie/Pyrenees Mix; Beatrice, a Border Collie; Mr. Squeaky, other wise known as Tater Pants; Rufous, a large-boned orange tabby; 2 donkeys; 6 goats; and 15 chickens! 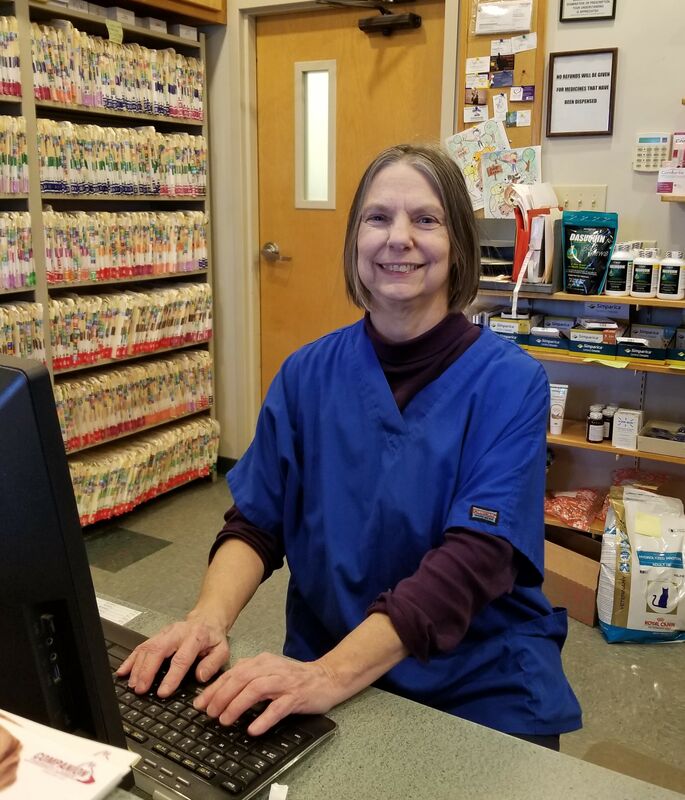 Paula's favorite thing about working in veterinary medicine and in our hospital is building relationships with our clients and helping them obtain and understand information related to their pet's health and well-being so they can best care for their pet. When Paula is not at the hospital she enjoys walking with her goats and dogs, gardening, and hiking/trail running with friends. Ashley is one of our Kennel Attendants! Ashley joined our team in the Summer of 2018. Ashley currently attends Indiana University- Bloomington where she is taking courses for an undergaduate degree! Karly is one of our Kennel Attendants and Assistants! Karly is currently attending Indiana University Bloomington and is studying animal behavior and psychology. Karly joined our team in 2017. Karly’s favorite thing about working at our hospital is getting to work with so many talented people and learning new things every day! Karly has a Shiba Inu named Keiko who acts like a cat and a Momo, a DSH who is clicker trained and enjoys riding around on her shoulders! When Karly isn’t at the hospital or working on her studies she works at WildCare caring for and training education animals (crows, foxes, hawks, and pigeons) and also fosters orphaned raccoons. In her free time she enjoys gaming, cat training, and Dungeons & Dragons! Nicole is one of our Kennel Attendants! Nicole is a graduate student at Indiana University working toward a Masters of Social Work. Nicole joined our team in 2013. Nicole’s favorite thing about working at our hospital is getting to know the clients and their pets, and learning about animal health and wellness! Nicole has a houseful of pets including her four dogs Nes, Nova, Moosh and Juneau, her cats Toddy, Benji and Baou, and a fish named Chips. When Nicole isn’t at the hospital or working on her studies, she volunteers for WildCare as the raccoon team leader, with Meals on Wheels and at Middle Way House. In her free time she enjoys hiking, reading and hanging out with her pets! Brad is one of our Client Service Representatives! Brad joined our team in the Spring of 2018. Brad enjoys working with and helping care for all the animals that visit the hospital! When Brad isn't at the hospital he says busy with three animals of his own: Houdini, a grey nose Labrador Mix; Rama, a grey Domestic Shorthair; and Ajax, a Great Dane! Chris is one of our receptionists! Chris lives in Bloomington, IN and went to Indiana University. Her favorite part of working in the hospital is being surrounded by others who care so much about animals. Chris has one dog, Gracie, a pit bull mix and a half Arabian horse named, Velvet. When not at the hospital Chris enjoys gardening, hiking, and reading mysteries. Jaime is one of our Receptionists. She has been working with animals since her freshman year of high school when she passed out viewing her first surgery (a guinea pig spay). She is originally from Buffalo, NY and moved to Indiana to attend IU for pre-vet. 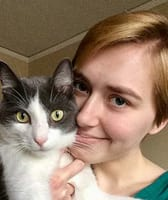 While on an internship for IU, she learned about the Brown County Humane Society and ended up working there and a few months later became the manager. She helped transition the shelter to becoming one of the first few open admission no-kill rural humane societies in the country. She has a house full of dogs and cats and even a pot belly pig named Hamwise Gamgee (aka Hammy). She has been married for almost 20 years and spends her free time outside camping year round and learning new things, like how to kayak through winter flood waters, building large burnable art structures, and how to play her favorite instrument, the darbuka. Working with our clients is Jaime's favorite part of working at the College Mall Vet. 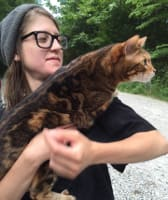 She frequently sees animals she adopted out visit our clinic and it has been a welcome relief seeing how well loved and cared for each of them are. Jennaya is one of our receptionists! Jennaya is originally from Ohio and went to Northwest State. She lives in Bloomington with her husband Roy, whom she met in Scuba Class, and their two beautiful children, Adriaen and Victoria! 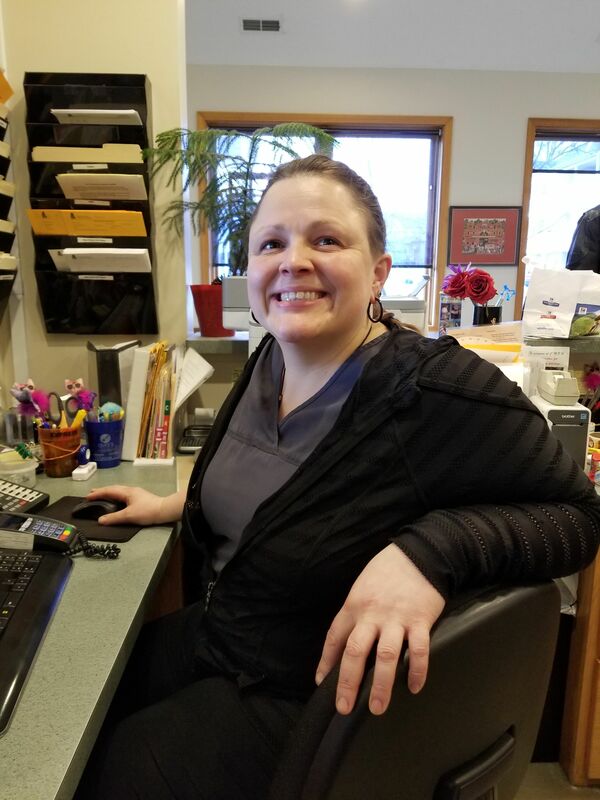 Jennaya enjoys working in veterinary medicine because of the “unexpected”- every day is different and every day is a challenge- she enjoys taking all the of the pieces of information from a client and helping them find what they need! Jennaya’s favorite part of working at our hospital is the bond she forms with our clients and patients. Jennaya has a Australian Shepherd mix, Sailor and three felines- one cat who adopted them, Eugene; Herman, found as a stray, is a “custom made tripod” whose leg had to be amputated; and Kee Kee who is very shy and prefers to stay under the bed! When Jennaya is not at the hospital she loves to spend time out on the boat with family and friends! Vivian is our Office Cat. Vivian joined our team in 2017! Vivian was brought to our clinic for an emergency exam after Bloomington Animal Care and Control found her on the side of the road. It was thought she had been hit by a car, which resulted in a likely fractured upper jaw, injuries to the insides of both eyes, and a cut on her leg. We fixed her leg and started her on pain medication and antibiotics. She did so well during her recovery with us and fit in so well with the staff, the shelter let us foster her and ultimatley adopt her due to the severity of the injuries to her eyes and being blind and stressed at the shelter. These injuries could have resulted in cancer in the future, so after a visit to Dr. Klein, a Veterinary Ophthalmologist, it was decided it would be best to remove both eyes. She is able to navigate the busy hospital with ease and she can jump and climb stairs. Her favorite pastimes are chasing paper balls and napping. She has been a wonderful addition to the team.